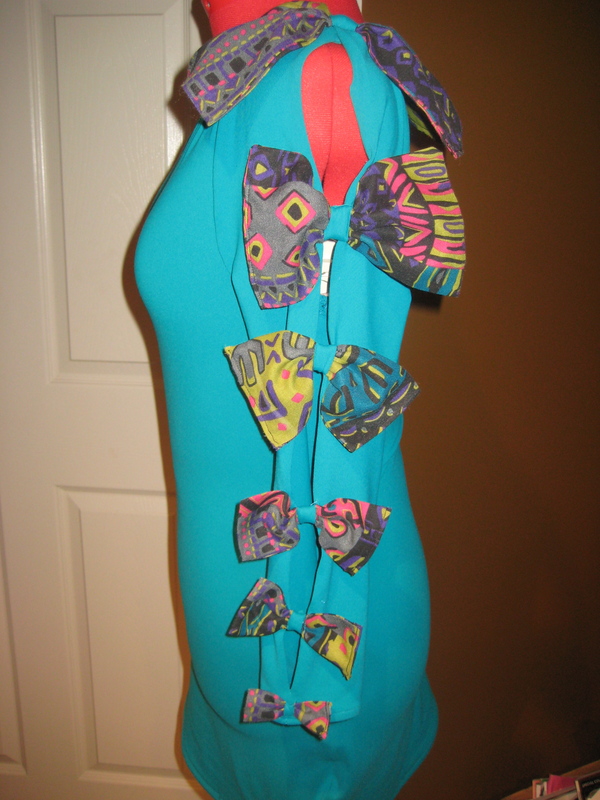 Ya’ll know I love to make a girl’s birthday dress! Jaime Bowman came to me for a dress for her second 22nd birthday. Jaime is from New York and shares a birthday with her mother. Since she was born their tradition was to spend it together. But this year Jaime is fresh out of college and working her first job in another state. When her birthday came around she wasn’t with friends and family and didn’t get to celebrate it the way she’s used to. So the following weekend she scheduled a trip home to re-do her birthday and she wanted to do it in one of my dresses. Jaime gave me full creative control (which I love) and I thought Jaime Bowman…BOWman…BOWS! 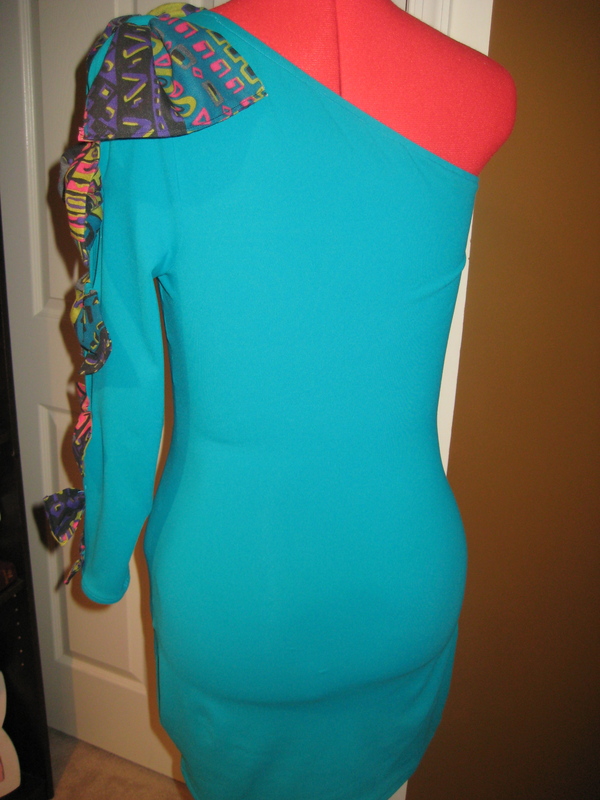 I created a colorful one sleeve frock for this 80s baby. 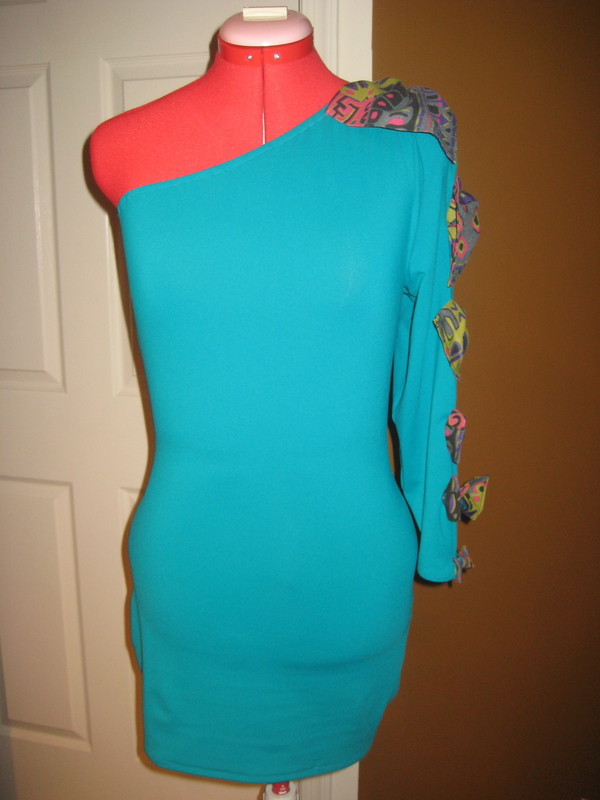 The sleeve is covered in bows hat decrease in size from the shoulder to the wrist. 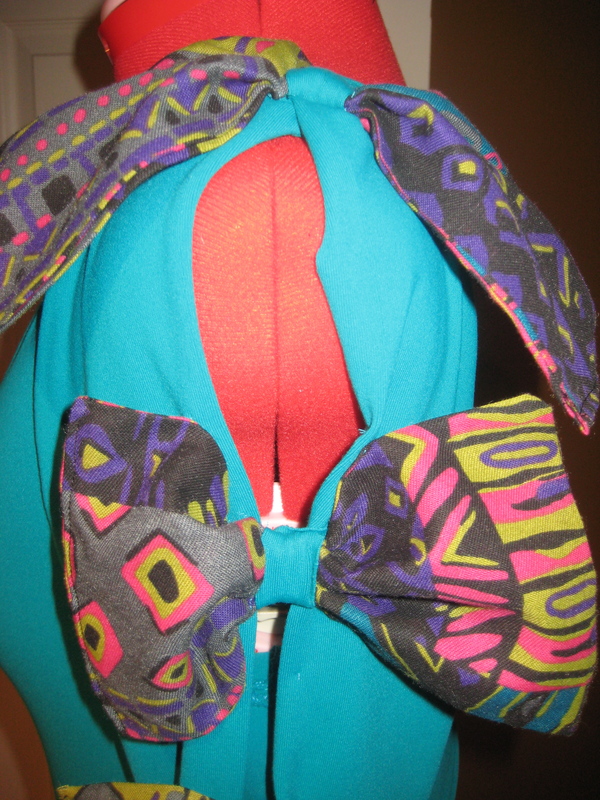 The body conscious teal is juxtaposed by the Bill Cosby-sweater printed bows. I’m so glad Jaime got to redo her birthday the right way and she looked amazing in her dress! 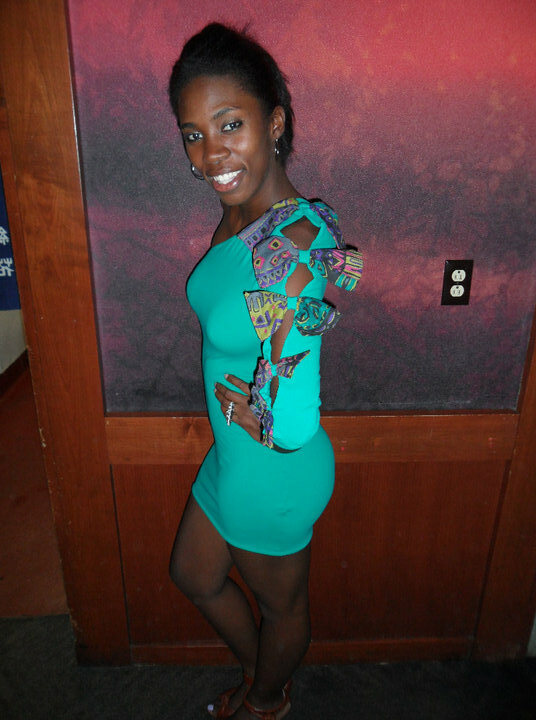 I absolutely Love this dress! Being and feeling fly on your special day is a must! As a valued customer, I have always been satisfied with Nicole’s work! This is an excellent design!! GREAT job!!! Super chic and fly!!! LOVES IT!!! Little Fashion Fair–glad you’re back on it! 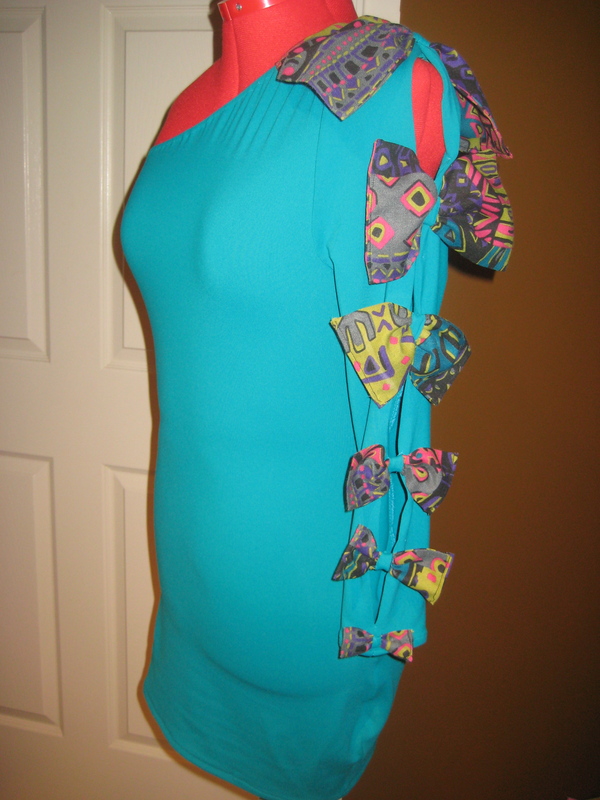 I have decided to dedicated two months at a time to a hobby- I am now on jewelry design and refashioning clothes that I own but no longer like into things that I would actually wear…I’ll let you know how it goes. Your designs and sewing are coming along well. I’m proud of you!